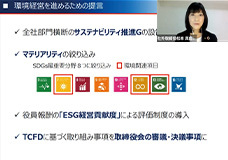 Shareholder Relations | Toyoda Gosei Co., Ltd.
We make every effort to raise corporate value and openly disclose information. This term saw revenue increase to 806.9 billion yen (up 6.8% from the previous year) thanks to the effects of increased sales in our automotive parts business and currency exchange rate fluctuations. Profits increased despite a worsening product mix and increased fixed costs. 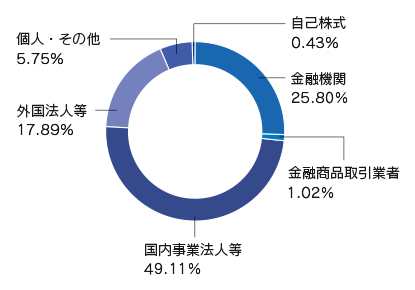 Operating profit was 41.1 billion yen (up 1.1% from the previous year), ordinary income was 43.2 billion yen (up 10.7% from the previous year), and net income attributable to parent company shareholders was 21.1 billion yen (up 30.4% from the previous year. All were bolstered by the increased automotive parts sales and exchange rate fluctuations. Consequently, the annual dividend from surplus distributed this year was 53 yen per share. Toyoda Gosei makes every effort to properly disclose information, issuing regular reports via our website and IR tools (earnings summary, data for financial briefings, etc. ), holding financial briefings, and participating in IR events. Specific measures include biannual earnings presentations and quarterly telephone conferences for institutional investors and securities analysts. Materials from these meetings and other relevant financial information are published on our website. We also provide information in individual investor meetings and to our many investors in Japan and other countries. Plant tours are held for institutional investors and security analysts to show our technical strengths, while we also participate in investor relation events for overseas institutional investors and hold briefings for individual investors to deepen understanding of our company. In 2016, Toyoda Gosei Co., Ltd. held its first plant tour for 25 securities company analysts who regularly gather information on our company and institutional investors who possess and manage Toyoda Gosei shares. To provide a better understanding of our technical abilities and future potential, we took participants on a tour of our Inazawa Plant to see the latest plating and painting processes for interior and exterior products and our efforts to make compact, automated production lines.